Users play an integral role in the performance of many robotic systems, and robotic systems must account for differences in users to improve collaborative performance. Much of the work in adapting to users has focused on designing teleoperation controllers that adjust to extrinsic user indicators such as force, or intent, but do not adjust to intrinsic user qualities. In contrast, the Human-Robot Interaction community has extensively studied intrinsic user qualities, but results may not rapidly be fed back into autonomy design. Here we provide foundational evidence for a new strategy that augments current shared control, and provide a mechanism to directly feed back results from the HRI community into autonomy design. Our evidence is based on a study examining the impact of the user quality "locus of control" on telepresence robot performance. 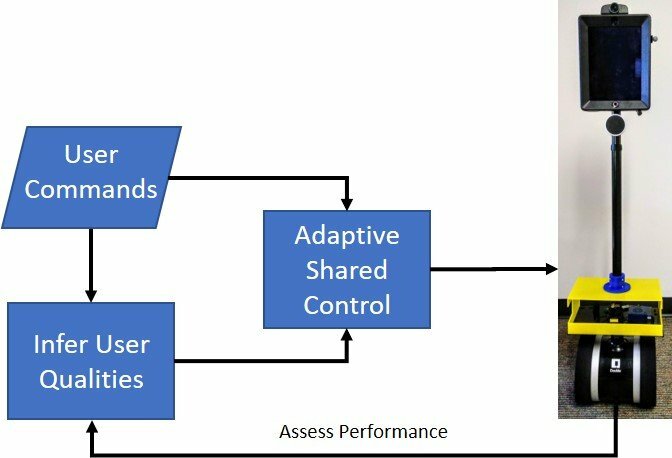 Our results support our hypothesis that key user qualities can be inferred from human-robot interactions (such as through path deviation or time to completion) and that switching or adaptive autonomies might improve shared control performance. Inferring user qualities during human-robot collaborative tasks may aid designing user-adaptive systems. We investigated relationships between user qualities and performance in restrictive and relaxed control regimes. We observed that performance was different between restrictive and relaxed control regimes. Our results indicate that key user qualities can be inferred from human-robot interactions.